Only because I am not going. It's in Cleveland and I am not driving out there, however, since next year it's in Baltimore, I'll be hitting it in. Hopefully, I'll be able to get some cool cards then. Received the National newsletter this morning and it announced some of the cards that would be available at the show. The newsletter reads: "The Topps Company continues a very popular tradition at the 30th National Sports Collectors Convention. Leaning on their long history, the 2009 Topps VIP Cards will be a 50th Anniversary version in the style of their 1959 issue. The cards in the set include "Cards That Never Were" also continuing a trend. 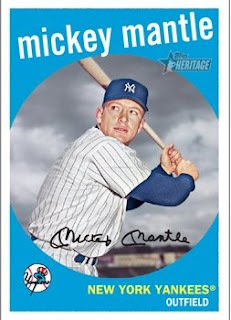 "Highlighting the issue are two different Mickey Mantle cards, one featuring The Mick batting left-handed, while the second shows him as a righty hitter. 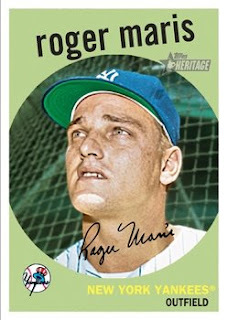 ... Also included is a 1959 Roger Maris card with Maris as a Yankee. 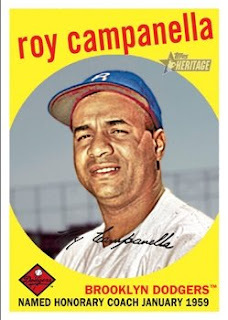 ... Another of these cards will show Roy Campanella as an Honorary Coach of the Dodgers. ... The final card in the 30th National Topps VIP Set shows Jackie Robinson. 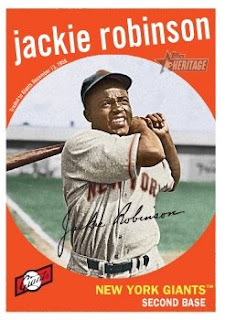 "We wondered what Jackie would have looked like in a Giants uniform and the 2009 National VIP card of Jackie Robinson answers that question." The VIP ticket price is $119 online and $129 on site. It's admission for all five days, including the sneak peek. You get to attend a little party, enter through the VIP entrance, use the VIP lounge, 12 VIP autograph tickets and a single set of VIP gifts. But it does not include parking. Heck. If you're not going, I'm not going. The National is in Baltimore next year!! Hell yeah!! I'll finally be able to go. Putting Jackie in a Giant uniform????!!!!!!! I officially boycott The National for the rest of recorded history. Night owl, Do I smell a blog? You smell correctly. It's up. May as well put Jeter in a Red Sox uni. I don't understand putting Jackie in a Giants uniform. I'm actually surprised MLBPA allows the card companies to put players in different uniforms. It's certainly an odd card. I get making cards that never were if a card wasn't made for some reason other than the event never happened.